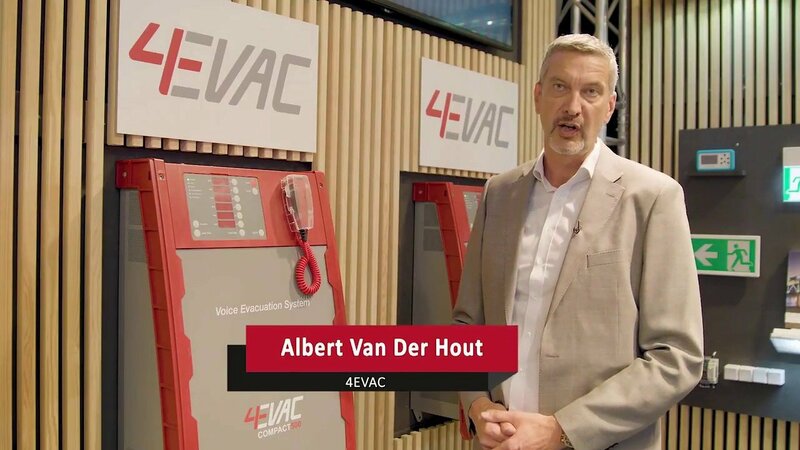 Albert Van der Hout presents the Compact 500 Voice Alarm Systems, one of the few full compliants wall box on the market nowadays. It has everything in a box from front and control with its six zone buttons. Each zone serving speaker line loads, Evac button and Alert button. There is a fully fuctionning fireman microphone for live broadcasting which is important nowadays. Compact 500 Voice Alarm Systems come with a variety of paging consoles beginning to a simple six zones push button console to a sophisticate touchscreen both for commercial use and for fireman use together with the wall box to fullfill the special need for scandinavian market. We can now networked the system together up to 256 nods generating system with up to 1500 speaker lines. Here we have the firemen console made for the Danish market, with a key lock and full functionning panel behind glass.